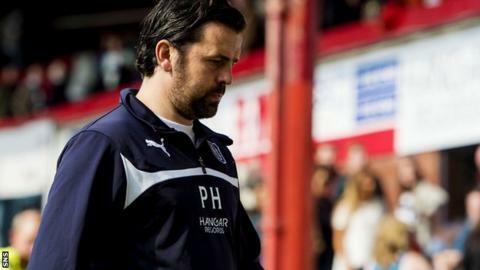 Dundee manager Paul Hartley admits his players must learn from their derby day humbling by United before the sides meet again in midweek. The Tangerines cruised to a 4-1 Premiership triumph on Sunday, with the city rivals squaring up again in the League Cup on Wednesday at Tannadice. "We'll sit down tomorrow, look at the video and look at what went wrong, and then hopefully we can rectify that on Wednesday night," Hartley said. "We have to pick ourselves up." United hit the front at Dens Park from the spot, with Mario Bilate netting the penalty after Thomas Konrad downed Gary Mackay-Steven in the box. Ryan Dow made it 2-0 in the second half after John Rankin robbed Jim McAlister of possession, before Callum Morris and Keith Watson headed home from Paul Paton free-kicks. Konrad saw red late on for a second booking and Greg Stewart drilled a consolation goal for Dundee in stoppage time. "We didn't do enough in the final third, we didn't work the goalkeeper, we gave the ball away at times in certain areas of the park and we didn't really hurt United," Hartley added. "We're disappointed in terms of the manner of the goals we lost, we felt we could have avoided them. "We got caught in the middle of the park twice and we'd spoken before the game about United pressing us. Then we got done by two set-pieces and we should have avoided that in terms of diving into challenges. "We knew that they've got good players in the final third and we really didn't deal with it at times. We've got to give credit to United as the best team won today."